We offer stage hire for any occasion and have a range of indoor stages and outdoor stages along with festival production packages. All stages are available in different sizes and configurations. The outdoor festival production stages are fully waterproof and come with sound, lighting, stairs and drum risers. Extras can be added to any package for example led screens, pa wings, wireless equipment etc.. 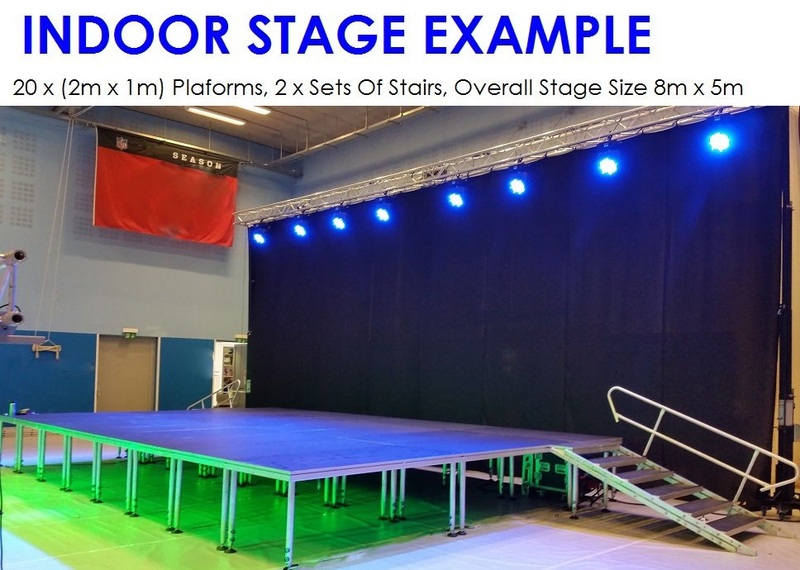 The indoor stage platforms offer the best solution for any kind of event, from small performance ensembles to large stages with the possibility of multiple configurations for permanent (indoors) and temporary installations (podiums, concerts, theatres, exhibitions, music halls, conservatoires, television studios, catwalks, tiered audience seating, band risers etc. ).Weather resistant modular platforms, certified for a load capacity of 1800 kg per platform, consisting of a sturdy aluminium frame with a non-slip, water resistant 100% birch plywood panel (21 mm), includes four telescopic legs (adjustable millimetre by millimetre).Thanks to their weather resistant birch panel and their aluminium legs and framework, Our Stage Platforms are suitable for both indoor and outdoor events. These features make our platforms the best option for those applications which require a high loading capacity and a quick and easy set-up and dismantling.